A friendly reader named Jhonn first alerted me to the veggie burger at Thistle Hill Tavern last fall… but it’s in Park Slope, a neighborhood I must admit I don’t find myself in too often, so I hadn’t had a chance to check it out yet, although I kept hearing the restaurant’s name (it was honored in Time Out New York’s 2011 Food & Drink Awards). But last weekend my dear friendCarlea, who just so happens to be a brilliant author, came up to New York to participate in a reading at Barbès in Brooklyn. We had to go somewhere for dinner afterwards, to celebrate, so why not someplace that was already on my veggie burger to-try list? (I’m sneaky like that… luckily, my friends humor me). 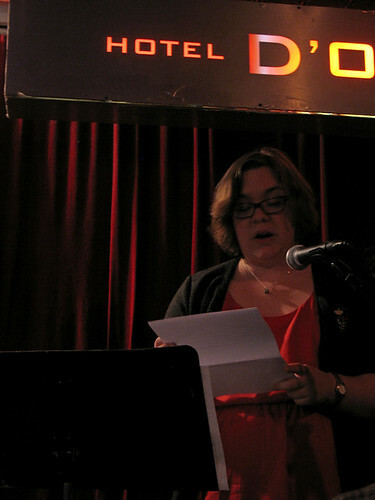 Carlea reading one of her short stories – check out her blog for a peek at some of her writing! We were finally seated and able to place our orders – the veggie burger is listed on the menu as “vegan burger” so there is no confusion there! 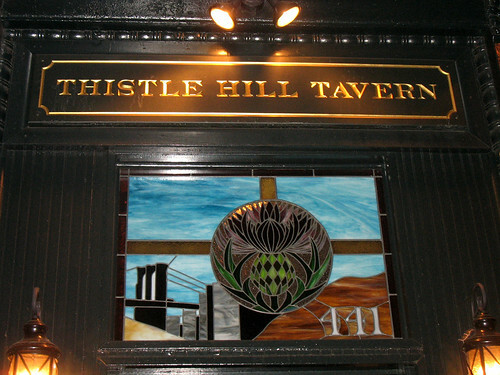 Bravo, Thistle Hill Tavern. It arrived with a side of the same tasty fries the host had given us a plate of to snack on while we stood around waiting (a very nice gesture). The burger was served on a potato roll, which was lightly toasted but still deliciously soft in the middle. And sweet but hearty, which is what I love about potato rolls. 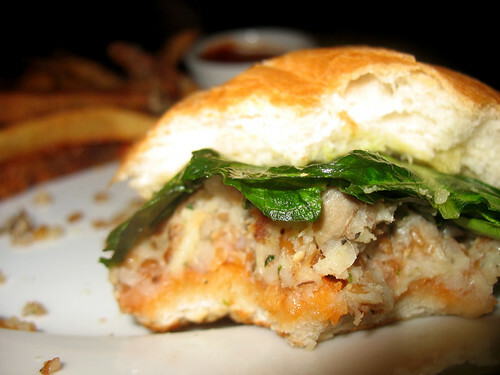 The patty itself was equally hearty – a mixture of white beans, mushrooms (tiny enough that they didn’t bother me!) and cracked wheat. I’m not sure I’ve had a burger with cracked wheat in it before, but it gave a great texture to the whole thing. I was quite impressed. 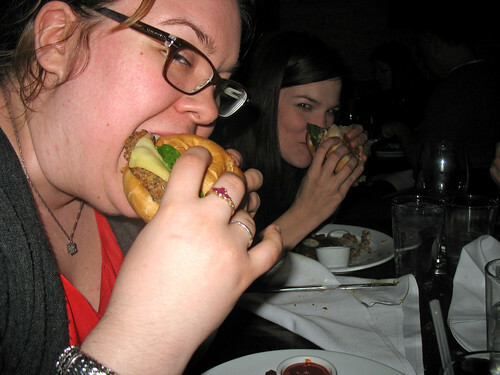 Two of my friends also ordered the veggie burgers, and enjoyed them too, although Carlea noted that the patty fell apart quite a bit as she was eating it. I ate all my pickles separately before biting into the burger, because that’s just a habit of mine going as far back as I can remember. But I still kept the lettuce and onion slices on it as toppings – I have to say, I wish there had been a spicy or smokey sauce on top as well. It needed a little bit of an extra kick and some extra moisture. I think sometimes chefs forget that veggie burgers aren’t going to ooze juices like meat burgers do without the addition of any extra elements. 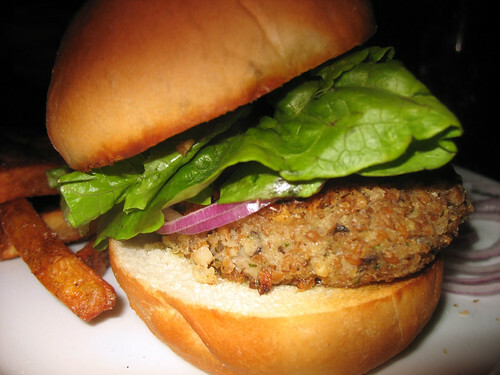 A good sauce is the perfect way to make a veggie burger deliciously flavorful and juicy. Overall, every one in our group decided that although we were quite famished and impatient by the end of our two hour wait for a table, the food was indeed worth the wait - both the veggie burgers and the other entrees that were eaten. And the restaurant staff were very nice to us (complementary appetizers, as well as the aforementioned french fries, won me over) and quite apologetic to us about the wait being twice as long as they had told us it would be. But I would recommend for others coming here in the future that you do not attempt it on a Saturday night with a party of more than two people! Or at least arrive later in the evening after the main dinner rush. that place looks perfect for me and the bf! Sorry to hear about the wait, but it's always nice to go to a popular place that's actually good, right? That fun NOFX fact alone would be enough to convince me to eat there! Awesome. 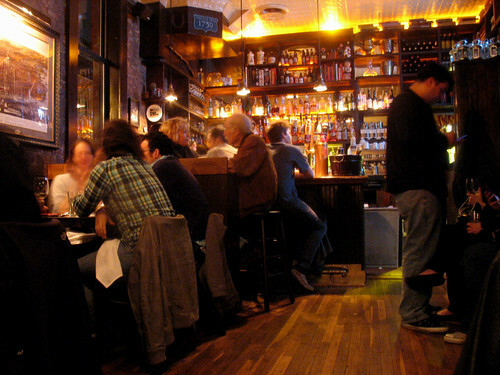 And the burger looks fab, but places with hour waits should DEFINITELY take reservations. Geez. 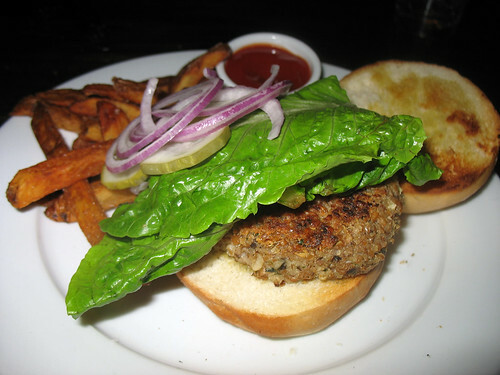 Now that looks like a veggie burger worth ordering! The combination of ingredients sound fantastic... Now I want to try making my own bean/mushroom burger, asap. Thanks for the shout out, Ali, and for allowing me, once again, to be part of Yum Veggie Burger history!